Prehistoric artists were better at portraying the walk of four-legged animals in their art than modern man, according to new research published December 5 in the open access journal PLoS ONE by Gabor Horvath and colleagues from Eotvos University (Budapest), Hungary. Most quadrupeds have a similar sequence in which they move each limb as they walk, trot or run, and this sequence was studied and outlined in the early 1880s by Eadweard Muybridge. The authors examined prehistoric and modern artwork ranging from cave paintings of cows and elephants to statues and paintings of horses, elephants and other quadrupeds in motion to see how well these artistic depictions matched the scientific observations of animal motion. 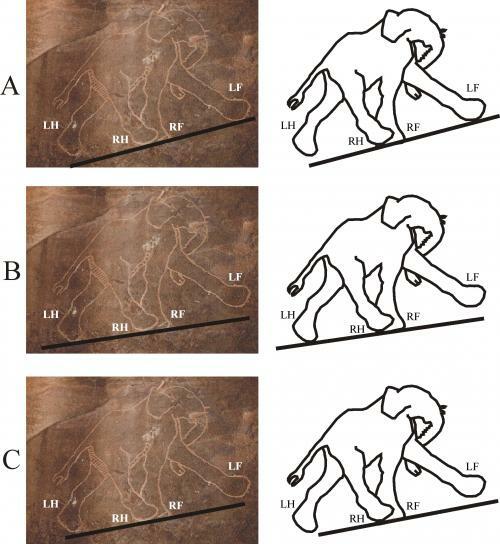 They found that the majority of depictions of these animals walking or trotting had their legs incorrectly positioned, but the prehistoric paintings had the lowest error rates of 46.2%, whereas modern pre-Muybridgean art depicted animal motion incorrectly 83.5% of the time. This error rate decreased to 57.9% after 1887. Whether these differences were due to artistic license with imagery or lack of understanding of animal movement isn't clear, say the authors.